Get exquisite double glazing that also offers great performance in Camberley and the neighbouring Surrey area. At Hart Windows, we give you the most competitive double glazing prices in Camberley for your home improvement. We always work as quickly and as effectively as we can, reducing hassle at every step. Enjoy market-leading, high-performance products without the extortionate price tag. From our products to our services, we always strive to offer quality throughout. At Hart Windows, we strive to give our customers great quality double glazing at superb prices in Camberley. This is why we offer a full spectrum of products in a range of materials. As a result, all your home improvement are fulfilled with us at Hart Windows. What’s more, you are assured of the performance and features of the doors, windows, and conservatories you buy from us. We bring you a beautiful selection of double glazed window styles, ranging from casement windows to sliding sash windows. You can get these in our more traditional uPVC, stunning aluminium, or engineered timber. Whatever the architectural style of your property, you are sure to find double glazing that will enhance your home like nothing else! The collection of windows is supplemented with our gorgeous door options. In order to give you a full double glazing spread, we offer front doors, back doors, and interior doors. Again, you can choose from uPVC doors, composite doors, aluminium doors, and engineered timber doors. We offer beautiful styles as well, including French doors, sliding patio doors, stable doors, and bi-fold doors. In fact, you can get a stunningly modern look with our aluminium bi-fold doors and aluminium patio doors. Both French doors and bi-fold doors look absolutely stunning in the conservatories and orangeries we provide. You can choose from our uPVC conservatory designs that include the lean-to conservatory, Edwardian conservatory, and a composite of the two. What’s more, we also offer a spectacular selection of conservatory roofs as well. As a result, you can tailor your extension to look just the way you want it. Get the complete range of windows from Hart Windows. We have double glazing for every home, need, and taste in Camberley. Our uPVC windows offer the stunning and high-quality Rehau and Liniar profile. Available in a range of styles including our classic casement range. With our Residence 9 engineered timber windows, you get style and elegance. 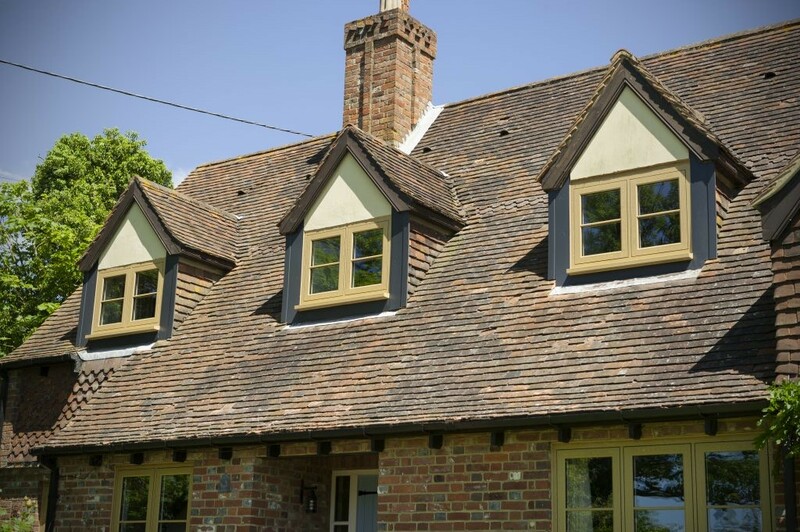 These sturdy windows are ideal for heritage properties, with their authentic timber appearance. For sleek and modern-looking windows, nothing beats our aluminium ranges of windows. These double glazed windows give you the exceptional strength of aluminium so your windows last long and keep your Camberley home safe. We give you durable and heat-efficient uPVC doors from Liniar and Rehau. These doors come in attractive styles and high quality double glazing to give you great performance and security. Our range of composite doors is brought to our Camberley customers by leading names like Solidor, DoorSmart, Endurance, and Visage. If clean and minimalist is what you desire, then our aluminium double glazing from Complete Doors and Smart Systems will leave you stunned. Finally, our sophisticated range of engineered timber doors from Residence 9 will add a touch of class to any Camberley home. If you are looking to extend the space in your Camberley home, our uPVC conservatories and orangeries are a stylish and long-lasting way to do it. With these beautiful designs, including the lean-to and Edwardian conservatories, you can create a spare room for your family. Our glazed extensions are fitted with high-quality double glazing so you get a safe and warm space to enjoy the weather and the outdoors. Besides, we offer some beautiful designs so your Camberley home gets a fabulous new feature as well. We also offer a range of conservatory roof replacements here at Hart, if you're instead looking to revamp your current extension without totally having to replace it. We have something for every taste and style. While not exactly double glazing, fascias, soffits, and guttering play an important role in the external appearance and performance of your home. We understand this and try to give you roofline products that look attractive, but also give you the quality and features that you deserve. Additionally, we also offer beautifully tiled and double glazed conservatory roofs from Synseal Global and Atlas to complete the look of your glazed extensions. If you want to improve the light and ventilation in your glazed extension or in your home, we have a spectacular selection of double glazed roof lanterns for you. In addition to improving the natural illumination in your home, our glazed lanterns also provide you with high heat-retaining double glazing for complete thermal performance. At Hart Windows, we have years of experience in the field of double glazing supply and installation. We like to transfer the benefits of this experience to our customers. When you choose us, you get FENSA-accredited installation from well-trained and professional installers. Additionally, we give you high-quality double glazing that is installed to the highest standards. As a result, you get beautiful fittings installed properly. Our double glazing installation is so efficient that you’ll get your doors and windows installed before you even know it. Moreover, we give you excellent customer care, so you get complete peace of mind. Our double glazing is designed to keep the heat retained within your home. As a result, you get a warmer home. Even when you turn your heating off, you can keep the room at a consistent temperature for longer. When we install your double glazing in your Camberley home, we ensure that the safety of your home is maintained. All our products are strong and durable. However, we supplement the strength with high-security locks from Yale and sturdy fittings so your home and family are always protected. Whether it is your windows, doors, conservatories, or roofline, we install them so you never have to worry about draughts or water entering your home at any time. No matter how bad or rough the weather is outside, your home will stay warmer and cosier with new double glazing. How Much Does Double Glazing Cost in Camberley? With Hart Windows, you get exceptionally competitive double glazing prices for your Camberley home improvements. We offer great products and great features at great prices! To learn more about what we offer in our double glazing range, and to find out about our fast turn-around, simply contact us online or call us on 01252 623404. Alternatively, you can visit our online quoting page to get an estimate of your double glazing prices, instantly!